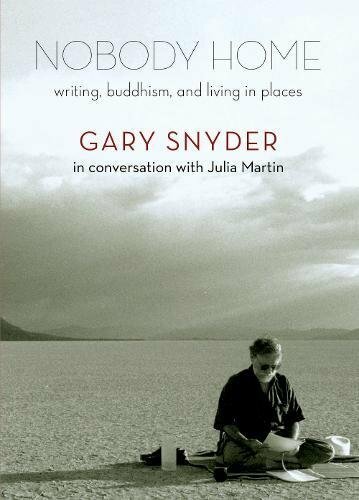 This is a healthy and thoughtful collection of interviews and correspondence between two writers of the earth: Pulitzer Prize winning poet and essayist Gary Snyder and South African author and scholar Julia Martin. Covering the decades from 1980 onward, the two activist thinkers and friends share their visions. Their subjects and themes range from Buddhism, writing, art, ecological and gender politics, issues of community, bioregionalism, and place sense. But it also contains the authors’ musings on family, suffering, age, and death. Following a long series of letters begun in 1984 between then graduate student Martin and established author Snyder, living in the Sierra Nevada Mountains of California, the first interview was set up. In 1988 Julia Martin had travelled to Snyder’s home, Kitkitdizze, which also has served as a co-op Zen Buddhist center. The second interview takes place in Eugene, Oregon in 2005 and is given the title “The Present Moment Happening.” It broadens some of the previous themes while placing them in the current times of war and terrorism, yet finding a ground in caring and Buddhist practice. The third interview “Enjoy It While You Can,” moves us back to Kitkitdizze in 2010 and is one of the best for clarifying and declaring the values and intentions of both authors. Note how her questions and comments get longer as she feels closer to the author and more confident of her own views. At this point, the book shifts into reproducing the letters between these two environmental authors. And in doing so, it backtracks to Martin’s first awkward inquiries of the ”eminent” author. Though his generosity gets them beyond this, coupled with his delight to find a young scholar working on his own writings, the correspondence that follows does not come up to the quality and depth of the interviews.